Maserati returned to motor racing in 2003 with the launch of a single-marque championship for the all new 177mph, V8 powered Cambiocorsa race car. With 26 identical cars on the start grid, the high profile 7 race series for non-professional drivers, ran in 5 European countries. Built on the production line to guarantee performance quality while reducing the overall weight to 1370kg, the cars have a 2 ltr engine, power output of 413bhp and race safety modifications including roll-over bar and cage, aerodynamic kit, racing seat and slick tyres. 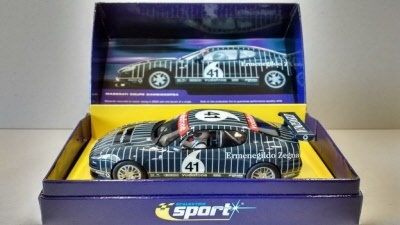 Limited edition version of the Scalextric Maserati Trofeo 2003 Cambiocorsa race car. The exclusive model features front and rear lights including high intensity ‘blue’ head lamps, adjustable magnatraction positions and a new round guide blade system offering excellent handling performance. The best eCommerce software by ShopFactory powers P2341. All-in one eCommerce and shopping cart software.